What is a Hero Shot? A ‘Hero Shot’ is just that- a picture of you, ready to save the day. Potential clients visiting your website are looking for someone to save them from whatever sticky situation they have gotten into, regardless of your area of expertise. 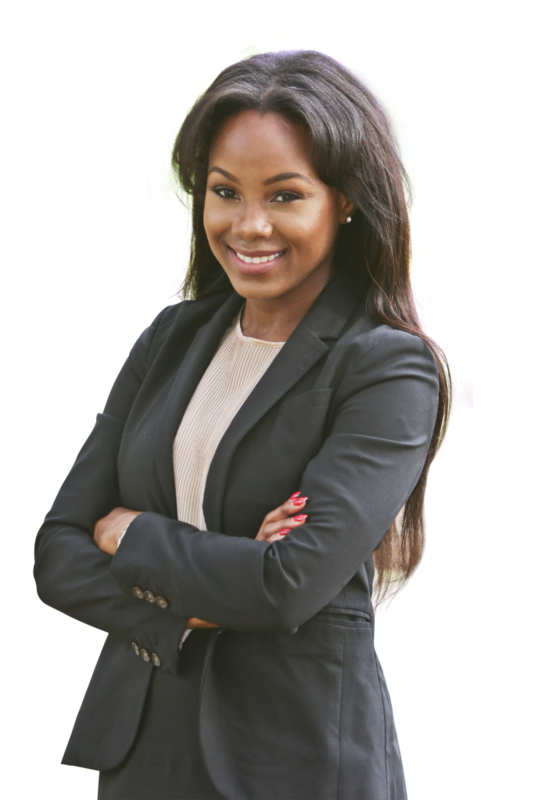 A crisp, clear shot of you, looking like the competent professional that you are, speaks volumes about your ability to produce their desired results. This image can be used in multiple places and ways when marketing your Law Firm, from the hero image on your homepage slider to use in advertisements on other channels. Why are Hero Shots Important? There has been a huge shift in the way that images are used online. In the past, it has been all about finding a perfect, flawless stock photo that speaks to the point you are trying to make. Research is now showing, however, that customers are more likely to have a positive reaction to a REAL image. For many businesses, these are action shots of their products, showing them in use. If you are an attorney, YOU are your product! That means that when a potential client visits your website, they want to see you, looking your best, with a winning gleam in your eye. Recipe for Fantastic Hero Shots that Convert! 1. Hire a Professional Photographer- Just do it. It makes good financial sense to make the investment in quality photography. We can recommend local photographers that we have worked with if you need assistance selecting a high-quality, affordable photographer. We can also work with your photographer to let them know what style and type of images we need for our online marketing efforts. 2. The Right Background- The background for your hero shot should be a solid, light color. Do not choose something the same color as your hair or your clothes, as we will remove the background for some uses. However, you will still want to use a professional backdrop, as we often use the full image for marketing purposes across the web. 3. 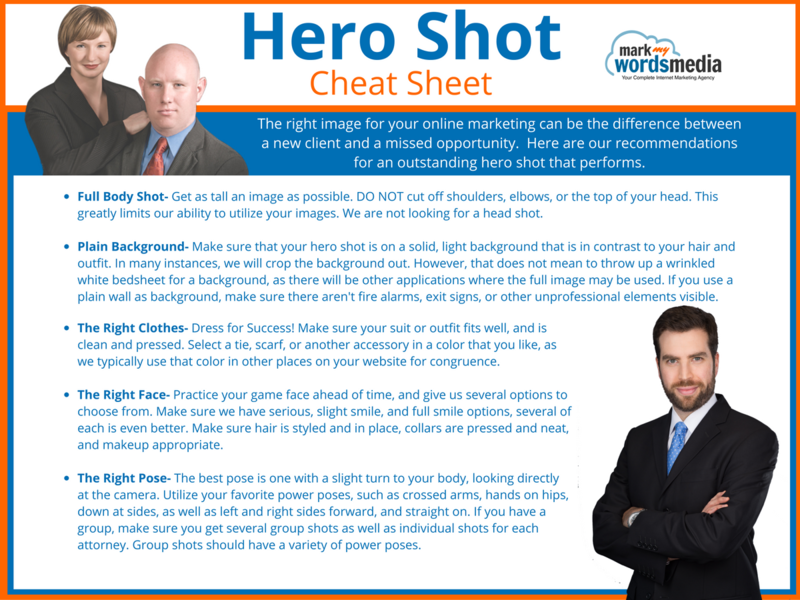 Get A Full Body Shot- We are not looking for a head shot, we are looking for a hero shot! Try to get as much of yourself in the picture as possible, at least to below the waist. Don’t cut off shoulders, elbows, tops of heads, or any other body parts as that will limit our ability to use the images. 4. The Right Pose- We are looking for a “Power Pose”, something that exudes confidence and success. This is typically accomplished by standing with a slight turn in your body, and your face looking directly at the camera. Try several different poses that you feel comfortable with, such as your hands on your hips, down at your sides, and arms crossed. 5. Wear the Right Clothes- The clothes that you select for your photo shoot should fit well and be clean and pressed. Have alternative clothing and accessory options available in case something doesn’t work out like you intended. Select a tie, scarf, pocket square, or other accessory in a color that you like, as we will typically use that color as an accent across your website for congruency. 6. Wear the Right Face- The image that you project depends on the face that you put forward. As far as aesthetics go, make sure that your face is clean, groomed, and that makeup is in place (no lipstick on teeth, have your photographer check for you, if uncertain). Beyond that, you will want several different expressions to choose from. We recommend a serious expression, partial smile, and full smile. Keep in mind what you want a potential client to think when they look at your picture. Do you want them to think that you are compassionate, yet firm? Do you want them to see you as an aggressive shark willing to do anything for them? Hold that idea firmly in your mind as your picture is taken. Business Law, Real Estate Law- Professional, Competent. 7. Take More Photos Than You Need- Solid Background, multiple poses, have them get shots of you at work as well, at your desk, in a board meeting, even shots of your lobby and the front of your building, if appropriate. 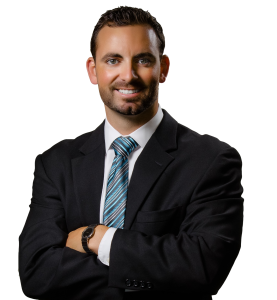 If your firm has multiple attorneys, make sure you get group shots as well as individual photos. We can use these images throughout the website and to support our online marketing efforts. Once you receive your image files, we will work together to select the appropriate image for your website and other online marketing needs. While your personal preference is important to us, we want to ensure that the selected image meets our requirements, and creates the right mood for your website visitor. You don’t have to be a model, you just need to put your best foot forward. You are not competing in a beauty contest, you are competing in a competent attorney contest. Physical attractiveness is not nearly as important as grooming, professionalism, and confidence, all of which you can control regardless of your physical attributes. As always, we are here to assist you with projecting a trustworthy, professional image to your website visitors. If you have questions, need assistance with finding a quality photographer, or simply want to learn more about how Mark My Words Media is helping lawyers succeed online, then give us a call at (877) 721-8491.